When it comes to the friendships in Harry Potter, the relationship between the titular hero and his BFFs, Ron and Hermione, will likely always be most popular for fans. That doesn’t mean others haven’t had Potterheads talking over the years, though. In particular, the friendship between James Potter, Sirius Black, Remus Lupin, and Peter Pettigrew has been a huge source of inspiration in the fandom. 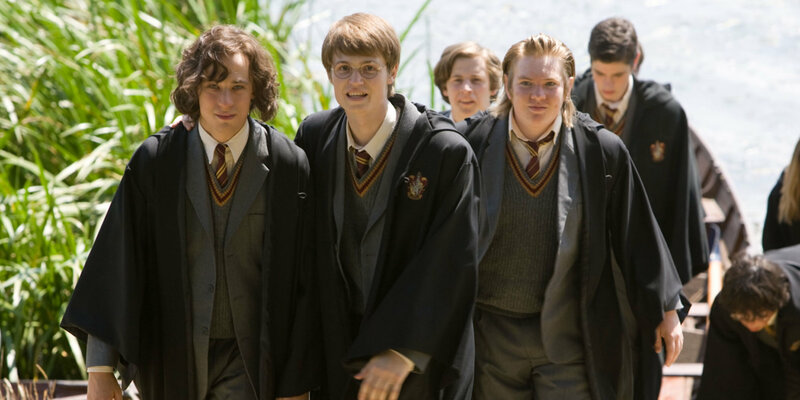 They’re sometimes known as the Marauders, and each member of this foursome played a vitally important role in the Harry Potter series, even though most of them had pretty limited time on screen. Fans have long obsessed over the minimal details we’ve gleaned about their time at Hogwarts from the books and films, but sadly, we just don’t have all that much to go on. The tidbits we do have about their lives just make us want to know more about the brave, reckless and ultimately tragic cohorts that solemnly swore they were up to no good. Here are 15 Things You Didn’t Know About the Marauders. Ask any Harry Potter aficionado who the Marauders are, and chances are they’ll have at least a vague idea. Despite the fact that it’s a commonly held nickname for James Potters’ group of Hogwarts friends, there’s not a tremendous amount of textual evidence in the Harry Potter series to show that’s what they actually called themselves. In fact, the only time it’s used in the books as a reference to Potter and his friends Remus Lupin, Sirius Black, and Peter Pettigrew is in regards to the mischievous map they left behind. The name stuck for fans, and is frequently used in fan fiction, art, film and general widespread fandom discussions about the characters. While it’s fun to imagine the four students had a secret Marauders handshake or wore little badges with ‘M’ on them, it’s more than likely that they adopted the name solely for the purpose of giving their magical parchment a really cool title. When Harry Potter first opens the Marauder's Map in Prisoner of Azkaban, he’s greeted with a cheeky introduction from “Mssrs Moony, Wormtail, Padfoot and Prongs.” By the end of the series, all four of those characters are dead and gone, casualties of Voldemort’s evil ways. In a strange twist of fate – or plotting – the characters passed away in exactly the opposite order from the way in which they were introduced as a group. Prongs, a.k.a. James Potter, died way back in 1980. In Harry Potter and the Order of Phoenix, Padfoot, a.k.a. Sirius, lost his life in the Department of Mysteries in 1996. Wormtail, a.k.a. super-jerk Peter Pettigrew, died in March of 1998, strangled by his own silver hand. Moony, a.k.a. Remus Lupin, tragically died in the Battle of Hogwarts in May of 1998. J.K. Rowling has never commented on whether or not the order was intentional, but it’s still a fun fact to know as long as you don’t get caught up in remembering how awful and tragic it is that they all died too soon. Throughout the course of the Harry Potter series, a lot of characters died (obviously). Unfortunately, many of them died trying to protect the titular character and his friends from certain doom under Lord Voldemort. While the Marauders were all tied together by their time as friends and roommates at Hogwarts, they also shared another, most certainly unplanned, connection. All four friends died while trying to protect the Boy Who Lived. James was Avada Kedavra-ed by Voldemort while trying to block the villain's path to Lily and Harry. Sirius put himself in front of Bellatrix’s wand – and lost his life as a result – to give Harry and his friends a chance to escape the Death Eaters. Lupin engaged Dolohov in a battle to distract him and let Harry continue on his quest to destroy a Horcrux. Even Peter Pettigrew, who worked directly for Voldemort, died because he couldn’t bring himself to strangle Harry in The Deathly Hallows. Of course, that was because Harry had saved his life and he owed him a magical debt of gratitude, but that doesn’t change the fact that he gave his life to prevent him from dying. The Harry Potter franchise got Sirius-ly lucky when Gary Oldman agreed to play the part of Harry’s godfather. After all, he’s one of the most talented actors of his generation, and he brought an incredible energy to the role of Sirius Black. There was just one problem: the Dark Knight actor was more than a decade older than his character likely would have been if the films were closely following their source material’s timeline. Likewise, Adrian Rawlins, David Thewlis, and Timothy Spall were also in their 40s when they landed their respective roles of James Potter, Remus Lupin, and Peter Pettigrew. The latter two would have been in their early 30s when they encountered Harry Potter. James, on the other hand, was just 21 years old when he died – almost two decades younger than the actor who portrayed him on screen. Ultimately, none of this really had an impact on how the story played out on screen, but it was enough to raise some eagle-eyed fans’ eyebrows, especially when James looked as old as his friends even though he’d been dead for years. Everyone involved in the Harry Potter film franchise had to know that fans were keeping a close eye on how faithfully they adapted the books to screen. Over the years, fans were keen to point out the many mistakes or creative liberties that the creative team took with the source material. One mistake in The Prisoner of Azkaban, however, was completely intentional. When the Marauder's Map displayed its creators’ names, Lupin’s was spelled as ‘Mooney’ instead of ‘Moony,’ as it appears in Rowling’s novels. It wasn’t a careless misspelling, but rather a bit of an inside joke for the HP production team. The visual effects supervisor for Prisoner of Azkaban was Karl Mooney, and his friends thought it might be fun to put his name on the map he helped create. That wasn’t the only not-so-hidden trick they fit into the map, either. In the film’s end credit sequence, which was styled like the map, fans caught a glimpse of two pairs of entangled footsteps – in other words, a couple of Hogwarts students getting into a little bit of hanky panky. It’s all in good fun, and while Lupin probably would have raised an eyebrow at the typo, we all know he and his fellow Marauders would have celebrated anyone who used their map as an excuse to get up to no good. J.K. Rowling seems to have a good time slowly revealing facts about the Harry Potter universe to fans. As a result, we’ve had to wait a while to learn things like birth dates and backstories for many of the supporting characters. We learned in The Deathly Hallows that James Potter was born on March 27, 1960. Remus Lupin’s birthday is March 10, 1960, which obviously makes him just a hair older than his good friend. In 2015, she finally revealed – on Twitter no less – that Sirius Black was born on November 3. Since it’s unlikely that he would have been able to start school with his friends had he not been born in 1959, this has led most fans to conclude that Padfoot is definitively the eldest of his crew, even though we don’t officially know Peter Pettigrew’s birthday yet. If she really wanted to throw fans a curve ball, and totally mess up a bunch of fan fictions, she could drop that bomb on us someday. But she wouldn’t do that, right? Right? One of the most memorable aspects of the Marauders’ friendship is that James, Sirius, and Peter chose to become Animagi – that is, wizards that can transform into animals at will – to keep their lycanthropic friend, Remus, company during his time of the month. In typically clever-if-slightly-obvious J.K. Rowling fashion, each of the animals they end up turning into reflect their respective personalities in more ways than one. Sure, Lupin’s werewolf form means that he’s more likely to eat people alive. Wolves are also often symbols of guardianship and familial loyalty, and those are traits that he exhibited both in his relationship to his fellow Marauders, and in his mentoring of Harry. Sirius, likewise, was firmly loyal, courageous, vigilant, and faithful, just like a dog. James was a stag, which is frequently a symbol of royalty or leadership. That makes perfect sense, since Harry’s dad was apparently the de facto leader of his friends. On the other hand, a rat is a symbol of uncleanliness and impurity, and Peter did, after all, literally rat his friends out to Voldemort. In retrospect, the rodent he turned into should have probably tipped his friends off that he was maybe not such a great guy. When the Weasleys handed over the Marauder's Map to Harry in his third year, they told him that it gave him an eagle eye of everything in Hogwarts. In Fred and George’s eyes, it catalogued every room, every staircase, every hidden passage that the castle had inside and around its hallowed walls. Unfortunately, over time, the incompleteness of the map became evident. There are a few key parts of the castle that seem to be hidden from view on the map. One is the Room of Requirement, which is more or less a moving target and would admittedly be hard to plot. Another is the Chamber of Secrets, which was merely a rumor when James, Sirius, Peter, and Remus first created in the map in the 1970s. In other words, the map more works as a documentation of all of the hidden areas of the castle that the Marauders found, but wasn’t quite magical enough to account for those that flew under their radar. Harry Potter and the Prisoner of Azkaban director Alfonso Cuaron had a pretty specific vision for bringing the Marauders to life. Early versions of the script featured a flashback sequence that introduced the audience to James, Sirius, Remus, and Peter as students at Hogwarts and showed them putting their map to good use. While planning the scene, Cuaron told his creative team that he wanted them to be modeled after the Beatles. It makes a lot of sense, from both a stylistic and a storytelling standpoint. James would be the clean-cut Paul, Sirius the moody John, Remus the introspective George, and Peter the always-overlooked Ringo. Cuaron requested that each of the teenaged Marauders have shaggy hair and sideburns, much like their rebellious musical counterparts. By all accounts, the Marauders were a force to be reckoned with during their time at Hogwarts. Their bond was forged early, too, as they were all roommates in Gryffindor House. That almost wasn’t the case, though, because the Sorting Hat had to think long and hard about where to place Peter Pettigrew. According to J.K. Rowling, Pettigrew exhibited many of the traits commonly found in Slytherin students, so the Hat was at a bit of a loss, and deliberated for more than five minutes before placing him (this is known as a Hatstall). In the end, as with other Hogwarts students – even Harry Potter himself – the Hat sided with the lions and ended up unintentionally changing the course of Wizarding history. If Pettigrew hadn’t been bunkmates with James, Remus and Sirius, they likely wouldn’t have bonded, and he wouldn’t have one day had the chance to turn his friends over to Voldemort. For the record, the Hat maintains that it made the right choice, because Pettigrew acted bravely in the moments leading up to his death. Better late than never, eh? From Cedric Diggory to Dobby the house elf, there were a whole lot of tragic deaths in the latter half of the Harry Potter series. Easily one of the most upsetting, though, for devout book fans, was Remus Lupin. He played a lot of roles in Harry’s life – a long-lost connection to his father, a mentor, a protector, and an ally, just to name a few. Lupin conquered a lot of demons, and overcame his fear of loving Tonks. He’d just had a son, for crying out loud! Why did he have to die?! It turns out, he didn’t. J.K. Rowling revealed in 2011 that she considered sparing Lupin’s life and letting him have some semblance of a happy ever after with his family. Then, she decided that Harry Potter should serve as a reminder to us all that war often leaves children parentless, and that the best way to make that point was to kill off our favorite werewolf. Point well taken. The first time we see Sirius Black in Harry Potter and the Prisoner of Azkaban, he looks like he’s stark raving mad. That’s because our hero’s godfather is gaunt, disheveled, and issuing a silent, terrifying scream from behind the moving image on the front page of The Daily Prophet. Throughout the film, we learn that he wasn’t responsible for turning Harry’s parents over to Voldemort, and that in fact he was more or less framed for his role in their murder by fellow Marauder, Peter Pettigrew. His false imprisoned was the driving force behind the rage he displays when we first meet him. Throughout the next two films, Harry builds a relationship with Sirius, learns more about what his dad was like at his age, and is encouraged to join the growing resistance against the Death Eaters. Still, despite the somewhat positive influence he had on Harry’s life, J.K. Rowling has remarked that he still had plenty of issues to work through. She’s commented at length about his role in Harry’s life, and the fact that he didn’t always do the best job of following his own advice. She’s called him out for his hypocrisy over the way he treated Severus Snape and his family house elf, Kreacher. She’s also insinuated that he was “unbalanced” due to his extended stay in Azkaban. None of this means that Rowling believed Sirius to be bad – more than anything, he was meant to show that adults don’t always have all the answers. Harry Potter inherited some of his most memorable qualities directly from his parents. He got his eyes from Lily (seriously, we don’t need to hear it again). He got his unruly hair from James, and he also may have gotten his talent for quidditch from his dearly departed father. Unfortunately, we might never know for sure, because when it comes to James Potters’ quidditch position, the official record is a bit confusing. In the film adaptation of Harry Potter and the Sorcerer’s Stone, we see a plaque that indicates James was Seeker for Gryffindor during his Hogwarts’ days. However, in 2000 – a year before that film hit theaters -- Rowling told fans that the elder Potter was, in fact, a Chaser. It’s easy to chalk this discrepancy up to a simple lack of communication between the author and the filmmakers, but it’s still been cause for debate by fans over the years. After all, a quidditch position can tell you a lot about a character, and we'll take any scrap of information about Harry's dad that we can get. The Marauder's Map passed through a few different hands throughout the course of the Harry Potter series. When readers first encountered it, the Weasley twins handed it over to Harry to give him a chance to escape Hogwarts and join his friends in Hogsmeade. Harry was able to keep the map in his possession through most of his tenure as a student, despite Snapes’ attempts to confiscate it. He even used it during the Battle of Hogwarts to find his friends. Some fans have wondered what would happen to the unique and insanely useful artifact once Harry grew up, and J.K. Rowling weighed in on the matter in 2007. Though many thought Harry might bequeath the map to Teddy Lupin, Remus’ son, Rowling said that it was more likely that it would have stayed with the Potters. Not because Harry would have handed it down, though. Rowling said that she had a feeling his oldest son, James, would have stolen the map out of his father’s desk and taken it back with him to Hogwarts, ensuring that the Marauders’ propensity for mischief would have carried on through at least a third generation. J.K. Rowling has said on more than one occasion that she doesn’t plan to explore the adventures of the Marauders at length in a prequel. She has thrown fans of Sirius and James a bit of a bone as a consolation prize, though. In 2008, she released a hand-written, 800 word untitled story to help raise money for the charities English PEN and the Dyslexia Society. The quick tale takes place when the duo are in their late teens, and involves a high-speed chase and Sirius’ iconic flying motorcycle. Though Sirius and James end up backed into an alleyway by two stern policemen, they escape captivity thanks to some help from their wands and three unidentified flying friends – who could very well be Remus, Peter and Lily. Though Rowling’s story only offers us a glimpse into their lives as teenage wizard rebels, we get a very real sense of how fun, and carefree, both James and Sirius were before they turned their attention to fighting Death Eaters and the forces of evil. Who’s your favorite Marauder? Let us know in the comments!